Roald Smeets brings you Pale lager which is a very pale to golden-coloured beer with a well attenuated body and a varying degree of noble hop bitterness. The brewing process for this beer developed in the mid 19th century when Gabriel Sedlmayr took pale ale brewing techniques back to the Spaten Brewery in Germany and applied it to existing lagering methods. This approach was picked up by other brewers, most notably Josef Groll of Bavaria who produced Pilsner Urquell in the city of Pilsen, now in the Czech Republic. The resulting pale coloured, lean and stable beers were very successful and gradually spread around the globe to become the most common form of beer consumed in the world today. Bavarian brewers in the sixteenth century were required by law to brew beer only during the cooler months of the year. In order to have beer available during the hot summer months, beers would be stored in caves and stone cellars, often under blocks of ice. In the period 1820-1830, a brewer named Gabriel Sedlmayr II the Younger, whose family was running the Spaten Brewery in Bavaria went around Europe to improve his brewing skills. When he returned, he used what he had learned to get a more stable and consistent lager beer. The Bavarian lager was still different from the widely-known modern lager; due to the use of dark malts it was quite dark, representing what is now called Dunkel beer or the stronger variety, Bock beer. The new recipe of the improved lager beer spread quickly over Europe. In particular Sedlmayr’s friend Anton Dreher used the new lagering technique to improve the Viennese beer in 1840–1841, creating Vienna lager. New kilning techniques enabled the use of lighter malts, giving the beer an amber-red rich colour. Pale lagers tend to be dry, lean, clean-tasting and crisp. Flavours may be subtle, with no traditional beer ingredient dominating the others. Hop character (bitterness, flavour, and aroma) ranges from negligible to a dry bitterness from noble hops. 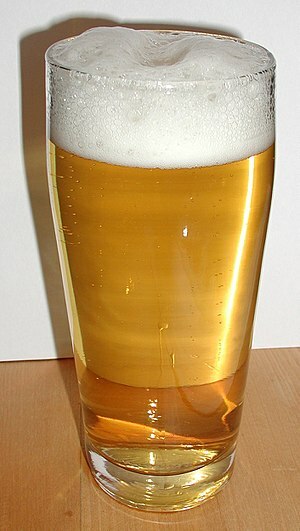 The main ingredients are water, Pilsner malt and noble hops, though some brewers use adjuncts such as rice or corn to lighten the body of the beer. There tends to be no butterscotch flavour from diacetyl, due to the slow, cold fermentation process. 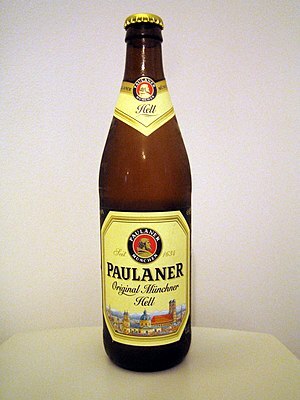 Pale lager was developed in the mid 19th century when Gabriel Sedlmayr took some British pale ale brewing techniques back to the Spaten Brewery in Germany, and started to modernise continental brewing methods. In 1842 Josef Groll of Pilsen, a city in western Bohemia in what is now the Czech Republic, used some of these methods to produce Pilsner Urquell, the first known example of a golden lager. This beer proved so successful that other breweries followed the trend, using the name Pilsner. Breweries now use the terms “lager” and “Pilsner” interchangeably, though pale lagers from Germany and the Czech Republic with the name Pilsner tend to have more evident noble hop aroma and dry finish than other pale lagers. With the success of Pilsen’s golden beer, the town of Dortmund in Germany started brewing pale lager in 1873. As Dortmund was a major brewing centre, and the town breweries grouped together to export the beer beyond the town, the brand name Dortmunder Export became known. Today, breweries in Denmark, the Netherlands, and North America brew pale lagers labelled as Dortmunder Export. A little later, in 1894, the Spaten Brewery in Munich recognised the success of these golden lagers and utilised the methods that Sedlmayr had brought home over 50 years earlier to produce their own light lager they named helles, which is German for “light coloured”, in order to distinguish it from dunkelbier or dunkles bier (“dark beer”), which is another type of beer typical for the region, being darker in colour and sweeter than helles. Examples of helles include Löwenbräu Original, Spaten Premium Lager, Weihenstephaner Original Bayrisch Mild, Hofbräu München Original, Augustiner Bräu Lagerbier Hell and Hacker-Pschorr Münchner Helles. The earliest known brewing of American lager was in the Old City section of Philadelphia by John Wagner in 1840 using yeast from his native Bavaria. Modern American-style lagers are usually made by large breweries such as Anheuser-Busch. Lightness of body is a cardinal virtue, both by design and since it allows the use of a high percentage of rice or corn. 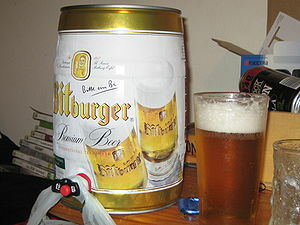 Though all lagers are well attenuated, a more fully fermented pale lager in Germany goes by the name Diet Pils. “Diet” in the instance not referring to being “light” in calories or body, rather its sugars are fully fermented into alcohol, allowing the beer to be targeted to diabetics. A marketing term for a fully attenuated pale lager, originally used in Japan by Asahi Breweries in 1987, “karakuchi” (辛口 dry? ), was taken up by the American brewer Anheuser-Busch in 1988 as “dry beer” for the Michelob brand, Michelob Dry. This was followed by other “dry beer” brands such as Bud Dry, though the marketing concept was not considered a success. In fully attenuated pale lagers, nearly all the sugar is converted to alcohol due to the long fermentation period. The resulting clean, lean flavour is referred to as “dry”. Premium lager is a marketing term sometimes used by brewers for products they wish to promote; there is no legal definition for such a product, but it is usually applied to an all malt product of around 5% abv. Anheuser-Busch also uses the terms “sub-premium” and “super-premium” to describe the low-end Busch beer and the slightly higher-end Michelob. Spezial is a stronger style of pale lager, mostly brewed in Southern Germany, but also found in Austria and Switzerland. Spezial slots in between helles and bock in terms of flavour characteristics and strength. Full-bodied and bittersweet, it is delicately spiced with German aroma hops. It has a gravity of between 12.5° and 13.5° Plato and an alcohol content of 5.5 – 5.8% abv. The style has been in slow decline over the last 30 years, but still accounts for around 10% of beer sales in Bavaria. Bock is a strong lager which has origins in the Hanseatic town Einbeck, Germany. The name is a corruption of the medieval German brewing town of Einbeck, but also means goat (buck) in German. The original bocks were dark beers, brewed from high-coloured malts. Modern bocks can be dark, amber or pale in colour. Bock was traditionally brewed for special occasions, often religious festivals such as Christmas, Easter or Lent. Malt liquor is an American term referring to a strong pale lager. In the UK, similarly-made beverages are called super-strength lager. be brewed by a Munich Company located within the city limits of Munich. Upon passing these criteria, a beer is designated Oktoberfest Beer. Oktoberfest beer is also a registered trademark of the Club of Munich Brewers. It is also known as Münchner Bier (Munich Beer). Bavarian beer (Bayrisches Bier) and beers produced in Munich (Münchner Bier) are protected by the European Union as a PGI Protected Geographical Indication. Traditionally Oktoberfestbiers were lagers of around 5.5 to 6% abv called Märzen – brewed in March and allowed to ferment slowly during the summer months. Originally these would have been dark lagers, but from 1872 a strong March brewed version of an amber-red Vienna lager made by Josef Sedlmayr became the favourite Oktoberfestbier. Since the 1970s the type of beer served at the festival has been a pale Märzen of 13.5 to 14º Plato and 5.5% to 6% abv. Though some Munich brewers still brew darker versions, mostly for export to the USA. The colour of these lagers may range from pale yellow to deep amber, with the darker colours more common in the USA. Hop levels tend not to be distinctive, though some USA examples may be firmly hopped. Modern beers sold as Oktoberfest and Märzen in Europe are mostly pale in colour.